ბერნდ ლენო (გერმ. 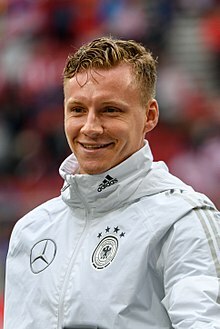 Bernd Leno; 4 მარტი, 1992; ბიტინგჰაიმ-ბისინგენი) — გერმანელი ფეხბურთელი, გერმანიის ბუნდესლიგის კლუბ ლევერკუზენის „ბაიერის“ მეკარე. 2011 წლის მაისში ლენომ „შტუტგარტთან“ გაახანგრძლივა კონტრაქტი 2014 წლის ივლისამდე. 2011 წლის 10 აგვისტოს ის გაანათხოვრეს „ბაიერ 04 ლევერკუზენში“ 2011 წლის 31 დეკემბრამდე. იჯარის ხელშეკრულების გაფორმებიდან ოთხ დღეში ლენოს დებიუტი შედგა ბუნდესლიგაში ბრემენის „ვერდერთან“ მატჩში. 2011 წლის 30 ნოემბერს ლენომ კლუბთან გააფორმა კონტრაქტი 2017 წლამდე. ↑ Changes afoot. VfB Stuttgart (17 May 2011). წაკითხვის თარიღი: 6 August 2011. ↑ Leno on loan to Leverkusen. VfB Stuttgart (10 August 2011). წაკითხვის თარიღი: 10 August 2011. ↑ Bayer 04 sign Stuttgart keeper Leno on loan. Bayer Leverkusen (10 August 2011). წაკითხვის თარიღი: 11 August 2011. ↑ Bernd Leno to sign for Bayer 04. VfB Stuttgart (30 November 2011). წაკითხვის თარიღი: 30 November 2011. ↑ Bayer 04 sign Bernd Leno. Bayer Leverkusen (30 November 2011). წაკითხვის თარიღი: 30 November 2011.
ეს გვერდი ბოლოს დარედაქტირდა: 13:24, 4 ივნისი 2018.